The lightness of being Neil Young must be just so unbearable. You go solo or reunite with your old band Buffalo Springfield, and fans wail about Crazy Horse. You re-group with Crazy Horse and record a covers album and fans wail about wanting new songs. Which brings us to the unbearable lightness of being ... Neil Young. Earlier this week, a new Shakey Pictures film for Americana debuted titled "A Day At The Gallery". The remarkable 40 minute silent film combined music from Americana , song videos, art by Shepard Fairey, and some dramatic/comedy acting by Neil Young and the Shakey Pictures crew. It was astonishing, unprecedented, amazing and -- in keeping with all things Neil related -- unexpected. But was it art? And does it matter? Some insist that "A Day At The Gallery" is nothing more than "40 minutes of self indulgence" and "a pretentious piece of crap". We -- and others -- disagree. On the Le Noise 2010 tour we posted a review "Expecting to See Neil Young (or Man Without A Net)" about how Neil had transcended being simply just a musician and how he had evolved into a performance artist. About how he creates new art forms by combining music, painting, film, writing and more into something wonderfully new and fun and exciting. This movie is not 'art' with a big 'A'. Just like Waging Heavy Peace is not 'literature' aiming at the Nobel prize. Just like Americana is not the best crafted song cycle in history. Neil is not a very good actor. In fact, he is a bad actor. Just like he is a 'bad' guitar player (yes, in every meaning of the word...). Just like Neil's music is not very 'good' in terms of playing the right notes at the right time in the right order. What makes most people mad is they don't understand it's not meant to be great. It's not meant to make you feel in awe of some genius. Neil is NO genius. He's just Neil and tries to stay Neil. The only thing that makes him stand out is that he is capable of being himself and do what he wants to do all his life. Not being bothered by fans, critics, anon's, hell, not even by us. So, it's just that capacity that I am in awe of. Just being yourself, and let it all out. Not holding back. Not being ashamed. Just do it. Be. That's not art - so you can't put him or his work down on that level, you just got it all wrong if you do so - it's LIFE. Neil's work breathes LIFE to me. Life worth living. He has his life, I have mine. So is A Day At The Gallery art and does it matter? In most cases the question is evaded with the usual assurance that “about taste and color it is impossible to argue.” This argument is just as vain as when someone pounds his fist on the table in support of his pet view. Let us preserve this particular charm to music, at any cost. By the very nature of its art, music is more sensitive to this than any other form of art, for everything in it is mystery. We know nothing about its beginning. Learned savants claim that man sung before he spoke—that song existed before speech. This opinion seems too poetic—altogether too contrary to the barbarism of primitive ages. Let us rather accept the theory that it was the warbling of the birds which first gave man the thought of music." Art doesn't need a purpose. Art is whatever we bring to it. And if that's truth, beauty and mystery, then that's OK with us. I just bought Americana at a local store in Austria and could not enjoy it more if it was "Austriana". Usually I am a silent listener, viewer and reader but sometimes, like now, I have to speak out how incredible thankful I am that Neil ist still letting us be part of his universe of sounds and pictures, feelings and thoughts, sorrows and visions. I have Americana, my first comment concerns the release in mid-july of the blue ray version with bonus material why 4 weeks later?. I accept it's a fine record with Neil enjoying himself not much to dislike although it does tend to become a little indulgent. For another day I guess, why release these covers when we still wait for TFA and the truly great songs from the 70s that have never been released? Is it a record I'll return to in a few weeks?....sorry no. That is a very nice observation by Peter D.
The movie at the gallery isn't art at all, that's just Neil having fun and looking for a way to deal with these fantastic paintings by Mr. Shepard Fairy. Reproductions should have been included with the album as postcards like these guys from the sixties did for their White Album. I have Americane too. Oh, No, No, No, sorry, I have 15 percent of Americana. After listening to these mp3 files for about a week I have to say that a cd never sounded better. First impression: there's not one song by the best songwriter in the history of popular music on this album. Great observation, definitely. A very quality assessment, Peter D., thanks for your contributions. I feel the need to agitate regarding the use of various terms. I do understand what you mean, or at least interpret it, process it and derive my own meaning. In a sense Life transcends mere Art. But I must say that there are very fine lines between life, art, and to borrow from one of SONY's comments, "expression". In this case, I see no difference between the three. It's all kind of the same to me. 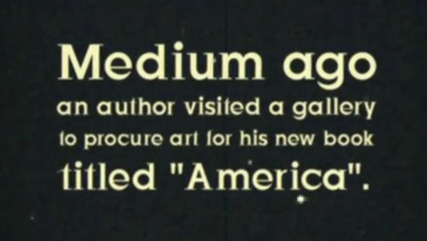 There's a medium being worked with, and film being an art-form, I guess I have a pedantic urge to call it technically art at the very least. I mean, we can argue about the definition of art, and whether a particular expression constitutes art, but in the end I suppose the argument itself is a little pointless. We all see it as something different in the end. Much like a good deal of songs by Neil and other folks, that resonate in this amorphous way to our own experiences, so that we all end up getting something personal out of them. A song might evoke a feeling tied to a certain memory... or our interpretation of the lyrical and musical content might be filtered through our unique collection of feelings and experiences, and draw a subjective reaction out of us. I've read a number of quite different interpretations of the meaning of the song After the Gold Rush that I find fascinating. It's interesting how any given image in the song is treated differently from one person to another. The image of the burned-out basement brings people to so many disparate places. My favorite idea, one which I had never thought of, was that the burned out basement was from a war-torn, post-apocalyptic place that ties in with the sci-fi theme. I'd always interpreted it as a place in Neil's mind. But anyway, I digress. My point is, there are so many ways to interpret the meaning of an expression, and what it represents to any of us, that outside of sharing our own subjective assessments, arguing about it becomes a pointless, futile exercise. Perhaps what matters is what we focus on. Art, expression, life, just plain old fun. But bravo to us for being thoughtful enough to have our varied ideas, and to at least try to reason them out. I do defend this as art, but my heart isn't really in that argument - I am more inclined to love it as 40 minutes of fun, and additionally art, expression and life secondarily. Also, another question I have regarding Peter's comment is... IS it NOT meant to be great? Perhaps I'm being too literal, but is it possible to confidently, assuredly state that? Is greatness something that is tried for anyway, or is most greatness accidental in nature? Do expressions strive for greatness specifically, or for something deeper? I guess that greatness is subject once again to personal interpretation. One man's garbage is another's treasure, I suppose. Here's a test- once you graduate from high school and find yourself in possession of a real job, there will inevitably come a time when you screw something up and your boss is standing in front of you, red-faced, calling you a dumbass. At that point, look him in the eye and tell him, "Sir, greatness is subject to personal interpretation. One man's trash is another man's treasure." I'm sure he'll appreciate the insight and will immediately understand that whatever you deem as greatness is, empirically, great. There have been some odd characters on this site - old Shittypants who would get all worked up in indignation whenever Neil's deity was called into question, but whose genuine love of the artist shone through every stroke of his Capslocked indignation; Mother Nature, quiet and eloquent until she suddenly went berserk - there are others, but no one has rambled on as pointlessly and cluelessly as you. I am, finally, bored to death with responding to your inanity, so, Mattie, farewell. Now feel free to post four hundred more howls of protest. No one will be able to figure out what the hell you're talking about anyway. Calling it "Neil" is truly more appropriate than waxing about "art". And what Neil does does reflect Life, in a most human and accessible way that is so much more realistic and attainable than some vague, pretentious label. You say 'Neil is NO genius'. Pull the other one. I really like Mr. Henry's Blake quote. That says it all. Amazing to me the people who say they are "die hard" NY fans who then grade his work or complain it is not what they wanted or expected. I remember people bitching about about Comes a Time -- "Neil has gone pop." "Too sunny." Seems to me to be a Neil Young fan is to understand: 1) It is all one song. 2) It is never the same song. That's part of what makes an artist. All that said: Americana is great fun; the band is back and sounds great; and the record has artistic integrity -- from the album notes and art to the short "silent" film. Americana is good--no one can judge how it will stand up over time, because it hasn't baked enough and none of are Prescient! Neil is on his own path of artistic creation, and how he chooses to share with us is up to him. I can listen to almost anything Neil, laughing or crying as the song spirit moves us. The promo vid is ok, I haven't loved it as much as the early lissenings of Americana, and Neil's comment about it is telling, at least he knows what he is up against in terms of...himself! His own standards and his own growth. That's one of the reasons he is so well loved, he's not afraid to continue that journey, and share his processes with us along the way. GSTQ is a wonderful evolving song, and it will be telling to see how Neil & CH will perform it for us at RR in August! "Art is just a dog on my porch"
Oh right, I forgot Neil once had a dog named Art. Well, now it's all clear. I have been mistaken.